Earlier this week, EFF recognized the accomplishments of U.S. Senator Ron Wyden, encryption expert Ian Goldberg (pictured left), and influential Tunisian blog Nawaat.org at the 20th annual Pioneer Awards Ceremony in San Francisco. EFF established the Pioneer Awards in 1992 to recognize leaders on the electronic frontier who are extending freedom and innovation in the realm of information technology. We were glad to welcome back to this year's ceremony a number of previous Pioneer Award winners, including Peter Neumann, Patrick Ball, Mark Klein, Whitfield Diffie, and Harvey Anderson and Tom Lowenthal on behalf of the Mozilla Foundation. Needless to say, this year's winners join an esteemed group. Keynote speaker Evan Williams and EFF Activism Director Rainey Reitman kicked off the program with a conversation about how Blogger and Twitter have changed the way we communicate online. As Evan put it, tools for publishing personal observations about the world revealed untapped potential for creativity and social change. He believes entrepreneurs have a responsibility to develop technology that enhances civil liberties online and to participate in political debates where free speech, privacy, and innovation might be at stake. 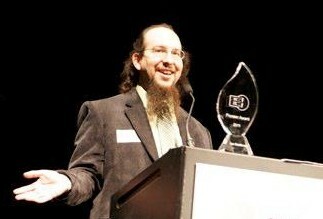 EFF Senior Staff Technologist Seth Schoen introduced our second Pioneer Award winner, technologist Ian Goldberg. As Seth explained, Ian has spent his entire career trying to ensure that cryptography's promise for enhancing privacy is really delivered -- both by showing how popular systems are insecure so they can be fixed, and by developing innovative new systems to protect users. After accepting his award, Ian described how and why he created the widely used instant message encryption program Off-The-Record Messaging and how he continues to dedicate his time to creating privacy-enhancing technologies. EFF Director of International Freedom of Expression Jillian York introduced the co-founders of Nawaat.org. The audience welcomed Sami Ben Gharbia, Malek Khadhraoui and Riadh Guerfali (pictured right) to the stage with resounding applause. 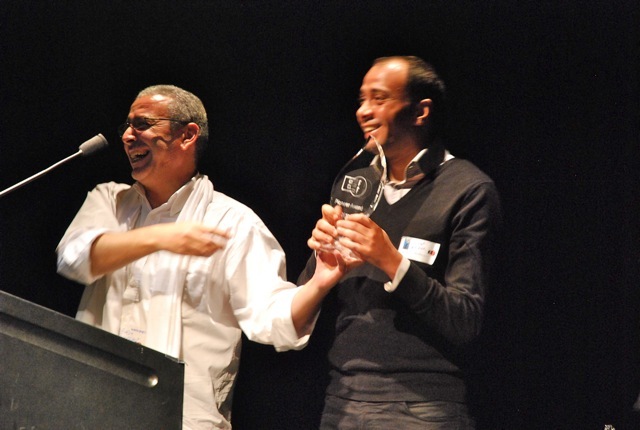 Taking tremendous risks to advocate for democracy under a repressive regime in Tunisia, the Nawaat team demonstrates the potential benefit to society when online communications remain free. Riadh exhorted the audience to think about what we want the Internet to look like for future generations and to do everything in our power to make that a reality. Each year, EFF Pioneer Award winners are nominated by members of the public. We invite you to keep an eye out for potential nominees and share their accomplishments with us next year at https://www.eff.org/awards/pioneer. Thank you to photographers Chris Rasch and Leez Wright.